The new national technical standards for e-bikes will take force on April 15, and they bring many changes. Dozens of people queue up outside the e-bike plate application spot on Xinyu Road E. in Changning District, on Friday. New national e-bike standards set to take effect from April 15 are pushing up sales, resulting in long queues outside e-bike plate application spots as people rush to register before the new rules kick in. 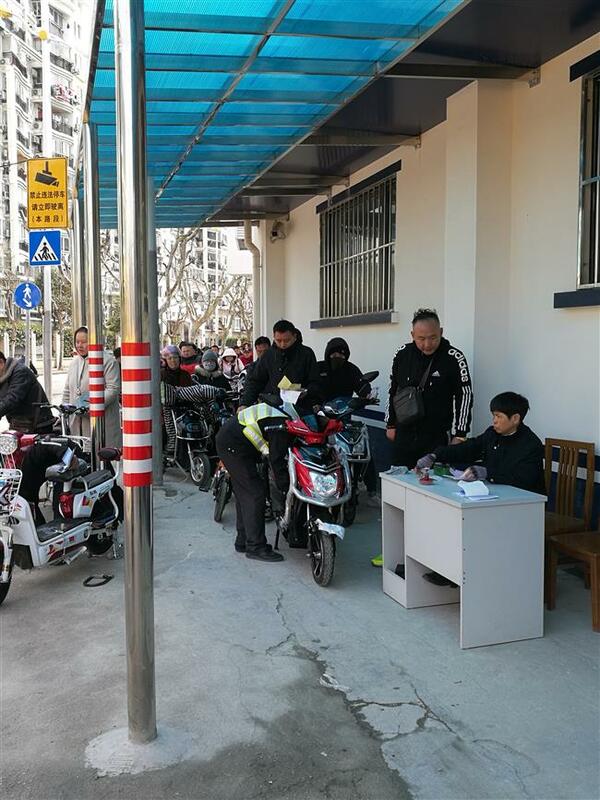 At the location on Xinyu Road E. in Changning District, a woman surnamed Chen was among dozens of people who took their newly bought e-bikes to apply for a plate from the police at 11am on Friday. 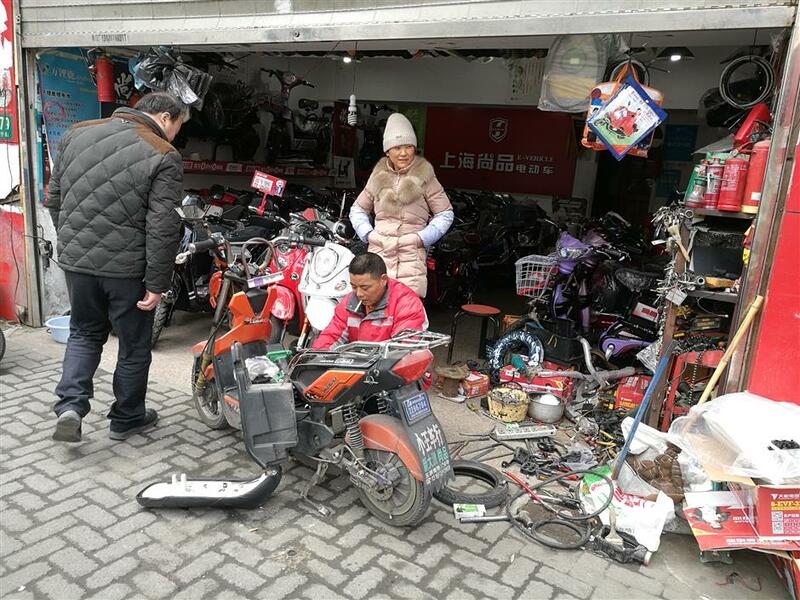 Chen, who lives in Minhang District, said she was applying for a plate for her e-bike in Changning because the daily limit of 180 reservations in her area are filled up by 5am. On an advertising poster inside a “Palla” e-bike dealership on the same street, it says that e-bikes under the new standards are more expensive. A man surnamed Wang, who runs a “Shangpin” e-bike dealership at nearby Weining Road, confirmed that. The current standards offer a suggested weight limit only. As the new standards will be compulsory, lithium batteries will be an ideal lighter and smaller alternative to lead-acid batteries, but they’re also more expensive. Wang (in the middle) repairs an e-bike for a customer on Friday. The new standards will replace the current ones which have been in force since October 1999. Besides the weight limit, the speed limit of e-bikes is raised to 25 kilometers per hour from 20, and the limit for rated power is raised to 400 watts from 240. According to the new standards, when an e-bike reaches a speed of 15 kilometers per hour, it has to sound a reminder to the rider, and an e-bike's motor control system should have features that prevent modification of speed limits. The voltage of its battery shouldn't be over 48 volts. In working out the standards, the government referred to international standards and those enforced in the European Union and Japan, according to the Ministry of Industry and Information Technology. Lu Yong, who runs an “Aima” e-bike dealership on Xinyu Road E., said e-bike sellers face uncertainty in sales after the new national standards are introduced. “If the new standards are to be strictly enforced, then e-bikes are going to be almost no different than plain bikes, so why would consumers buy them when they’re much more expensive than bikes?” he asked. Shanghai traffic police said on Friday that residents who purchase e-bikes before April 15 have to get a plate before April 29, and from April 30 all e-bikes manufactured on old technical standards won’t be eligible. According to non-motor vehicle administration rules in Shanghai, all e-bikes have to be registered within 15 days from purchase. It has been rumored lately that e-bike riders in China will have to take tests to get a license for riding e-bikes, but Shanghai traffic police state that's not true. There are over 200 million e-bikes being used by residents in China currently, and there were about 900 e-bike manufacturers in the country by the end of 2016, according to the national statistics bureau.